Everyone seems to love Vietnamese Salad Rolls with Nuoc Cham dipping sauce. I too love these crunchy salad rolls bursting with the flavour of fresh herbs and vegetables that are all naturally gluten free. In my hands-on cooking class featuring rice noodles students make these salad rolls. People often find them to be a bit of a challenge at first but once they roll up a few and figure out how much filling to use they come together easily. We usually eat the first few and put the nicer looking ones on a tray for the table. Making these is a great activity to do with friends and you will see how easy it really is when you’ve done all the prep in advance. Working with rice paper takes a little practise but you can certainly learn to do it. I like to prepare all the ingredients including the nuoc cham sauce the day before I make and serve my salad rolls to company. Then when guests are about to arrive I just line up all the containers on the counter; soft rice vermicelli, grated carrot, chopped lettuce, cooked shrimp and fresh herbs. Next I fill a large bowl with hot water for soaking the rice paper (I know exactly which bowl to use for this purpose). Then the little assembly line is ready so you can pour the wine and begin rolling. Nuoc mam is the Vietnamese word for fish sauce and nuoc cham is the traditional dipping sauce that is made with fish sauce. It is my favourite but I also see salad rolls served with hoisin sauce or peanut sauce so serve it how you like it. Here is my homemade Peanut Sauce recipe. Got vegan friends? Someone allergic to fish? 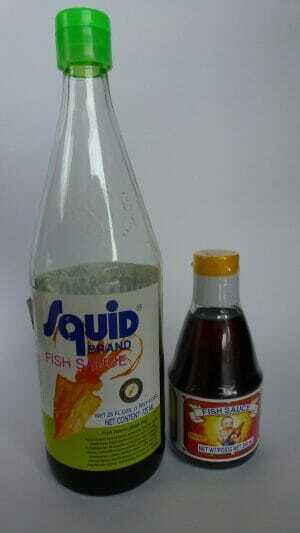 Try this Vegan Fish Sauce Substitute so everyone can enjoy Thai and Vietnamese cuisine. Rice paper wrappers are made from a mixture of rice flour, water and salt then rolled and dried into very brittle, thin shapes. The round papers are used for salad rolls and spring rolls, while the triangular ones are traditionally used at the table to wrap grilled foods. The wrappers are often sold in hard plastic containers and should be stored flat in the container or an air tight plastic bag. If left open they will curl up and loose their shape. To use them soften sheets one at a time in hot water. Slip the wrapper into the water for less than a minute until it becomes flexible enough to work with. Place the wrapper on the counter or a cutting board and add a small amount of filling on the bottom third of the wrapper. Fold the bottom up to cover the filling. Then fold the two sides into the middle. Now roll the filling up until you have a small sausage shape roll. I roll up about 12 or 24 salad rolls at a time depending on the occasion. Place them in a single layer on a tray and cover with plastic wrap. They can be stored in the fridge for up to 8 hours before serving. Salad rolls can be served whole or cut in half. You can garnish your plates or platter with the fresh herbs that you used in the filling. When I want an idea for a different presentation I just type the name of my recipe into the Google Images search bar and voila, more ideas than I have time to look at. I’d love to hear in the comments below how your salad roll wrapping worked out. Soak rice noodles in a large bowl of warm water for about 15 minutes. Drain completely and lay on a kitchen towel to dry thoroughly. Combine all ingredients in a large measuring cup. Stir until the sugar is dissolved. Set aside. Prepare all other ingredients before making the salad rolls. Use a large, flat bowl that is larger than the size of the rice paper wrappers. Fill the bowl with very hot tap water. Place one rice paper wrapper in the bowl and push it under the water. Let it soak for about 10 seconds to soften. Take it out of the water and place it on the counter. Replace the water in the dish as needed, it must be quite warm to soften the wrappers. Place 3 shrimp halves at the bottom third of the wrapper. Top with a small sausage shaped pile of noodles. Top with a small amount of carrot, lettuce, herbs and peanuts. Whatever you place on the wrapper first is what will show through the finished salad roll. Vary the look by starting with herbs. Fold the bottom of the wrapper up over the filling. Next fold over each side of the wrapper. Now hold the filling and roll it up keeping it as tight as possible. Place salad rolls in a single layer on a plate covered with plastic wrap or a damp towel. Continue making salad rolls and covering them up as you go. If not serving immediately, keep the salad rolls tightly covered with plastic wrap in the fridge for 4-6 hours. Serve them whole or cut on a diagonal with Nuoc Cham dipping sauce or peanut sauce.